Seattle Seahawks running back Marshawn Lynch tweeted a photo of some hung-up cleats on Feb. 7 in what seems to be a confirmation that the popular running back is retiring after all. Rumors had swirled in recent days that the five-time Pro Bowl selection would retire after missing more than half of the 2015 season with injuries. Lynch’s 417 rushing yards this past season were a career-low. As were his seven games played. 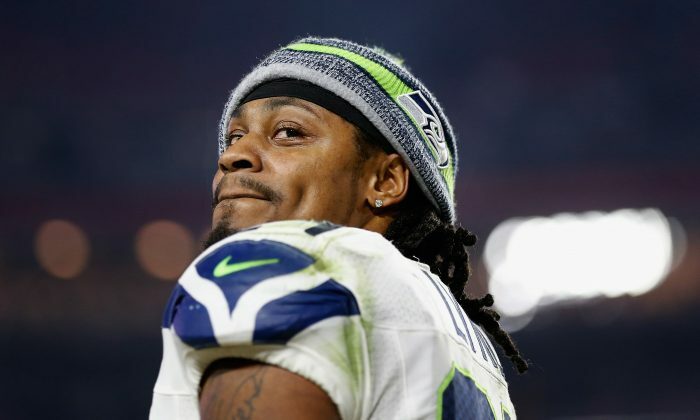 The NFL world reacted to the news of Lynch’s assumed announcement. @Seahawks Thank you @MoneyLynch for a great career as a Seahawk. So many memorable runs and quakes! #BeastMode ! And highlights of “Beast Mode’s” career were remembered. Lynch was the 12th overall pick in the 2007 NFL Draft out of California, by the Buffalo Bills. The hard-charging running back gained over 1,000 yards in each of his first two seasons. But after pleading guilty to a misdemeanor gun charge in 2009, the NFL hit him with a three-game suspension and the Bills decided to trade him four games into the 2010 season, acquiring fourth- and fifth-round picks. The move has turned out to be a steal, like so many others in the Pete Carroll-era. From 2011–15 Lynch recorded four straight seasons of 1,200-plus yards. The highlight being his 1,590-yard season in 2012 that earned him an All-Pro distinction. The highlight play, though, was his now-celebrated 67-yard run through, around, and past the Saints defense in the Wild Card round of the 2010 NFL Playoffs that let the rest of the NFL world know that Beast Mode had officially arrived in Seattle. As he grew, so did the team’s profile drafting talented players like Russell Wilson, Richard Sherman, and Kam Chancellor as the Seahawks suddenly turned into an NFL power, winning back-to-back NFC titles as well as Super Bowl XLVIII. Aaron Hernandez still has positive things to say about his former quarterback Tom Brady. But not Bob Kraft. Few details have emerged regarding Schumacher's condition.